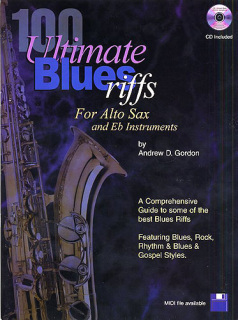 100 Ultimate Blues Riffs for Alto Saxophone is written by internationally acclaimed author and instructor Andrew D. Gordon. This product is an exhaustive guide to the various phrases or “riffs” that make up Blues saxophone playing, both from a rhythmic and soloing standpoint. This book is ideal for most levels of musicianship, from the beginner/intermediate student who is interested in understanding and playing the Blues to more advanced players that need new ideas to help stimulate their creativity. It is also useful as a tool for improving one’s sight reading abilities with the examples being in many different keys and rhythms. The 12 bar Blues progression and the Blues scale are also explained. Included with this book is a CD with each example recorded twice. The first version of each example has the saxophone playing along with a rhythm section and the second version just has the rhythm section playing so that the saxophonist can play along. An optional MIDI disk in General MIDI format is available.